When most people think of Route 66, diners with neon signs might be some of the images that come to mind. If you’re journeying along the Mother Road, no road trip is complete without fantastic food! Route 66 is famous for its classic cuisine, and Bloomington-Normal offers plenty of options for visitors to choose from. With its antique mahogany bar, historic tin ceiling and inclusive family-like atmosphere, not much has changed at Lucca Grill since it opened in 1936. 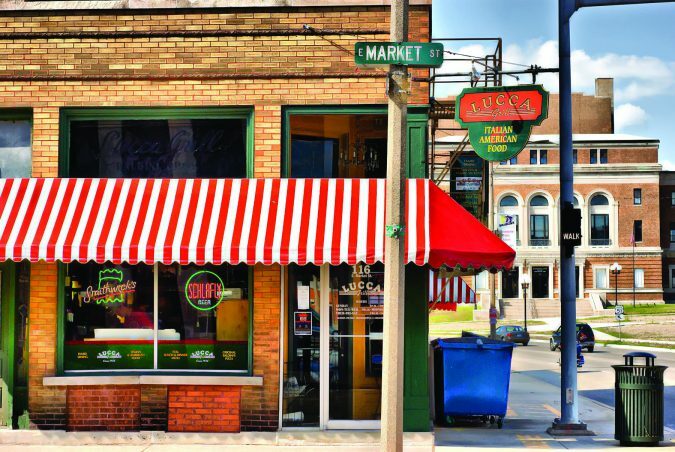 Founded by the Baldini brothers, they are famous for the pizza and pasta. Kicks Bar and Grill in Towanda allows visitors to kick back and enjoy some quintessential Route 66 road food, including burgers and fried chicken. Kelly’s on 66 is a family-friendly restaurant located in the historic building that was originally home to Skelley’s Service Station and Toby’s Mesa Café. The restaurant features homemade pizza and pies and cakes made from scratch. The Dixie Truck Stop in McLean opened in 1928 to serve travelers on Route 66. It is now full-fledged restaurant that is open 24 hours a day. We hope you’ve saved room for dessert, because Bloomington-Normal has several stops where you can pick up some sweet treats along your journey. Funk’s Grove Pure Maple Sirup has been in business since 1891. Tours are given during the sirup making season. Visitors can purchase the sirup and other Route 66 souvenirs in the gift shop. If you want a touch of salt to go with your sweet tooth, look no further then BEER NUTS. Bloomington is the only city in the world where Beer Nuts are made. The company produces different types of nuts covered with a sweet and salty glaze. Visitors can view a video presentation in the gift shop. Even though large sections of Route 66 no longer exist, many Route 66 attractions remain. Ryburn Place at Sprague’s Super Service opened in 1931 and served travelers on Route 66. Today, it is a gift shop that sells Route 66 memorabilia. The Cruisin’ with Lincoln on 66 Visitors Center features unique exhibits, local information and a gift shop. A Geographical Journey Parkway is a 1.6 mile stretch of the Mother Road that is lined with educational kiosks. Close to the parkway is Dead Man’s Curve, a dangerous curve on the original road that caused many passenger accidents. Route 66 was considered the ultimate symbol of freedom on the road, and so much of its past is in Bloomington-Normal. The restaurants and historic sites are a time capsule for visitors, capturing the feel of the golden area while making it accessible for the modern traveler. History is happening here, so grab your silverware and dig in!